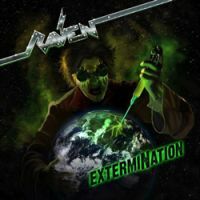 Heavy metal veterans Raven return after six years with what promises to be one of the bands finest achievements yet. Indeed, the “ExtermiNation” experience is one to savour. This is untainted, unpretentious balls-out metal that owes its leather-clad behind to history. Still, it’s far from being a nostalgia trip. Number like the storming album opener “Destroy All Monsters”, “One More Day” and the furious “Battle March Tank Treads” instantly hit a raw nerve with the listener. Perhaps somewhat astonishingly, it all sounds like a band in their prime – Mark Gallagher orchestrating a barrage of muscly riffs with considerable aplomb with John’s ageless vocals confidently hovering above a watertight rhythm section. “Fire Burns Within” is bouncing on a tangible 80’s hard rock vibe, but perhaps the best moment of the album comes with “Thunder Down Under” – you’ll see why when you’ll hear the pumping Kirk Hammett like riff tumbling out of the speakers. Beware! It’s heartening to hear Raven swagger tangibly as they dispatch each of “ExtermiNation” selections. In a way, it’s like an old friend coming home.